cheesecakes & put them in the oven for a short time untill the Edges are highly browned NB add a little sifted sugar to the whites before you beat them. Miss Pyes Cakes 12 ounces of Flour - 12 ounces of sugar 6 ounces of Butter, the rind of a lemon grated - 2 Eggs - one tablespoonfull of Ratafie Baked on tins. Green Goosberry Wine Miss [Pyer?] 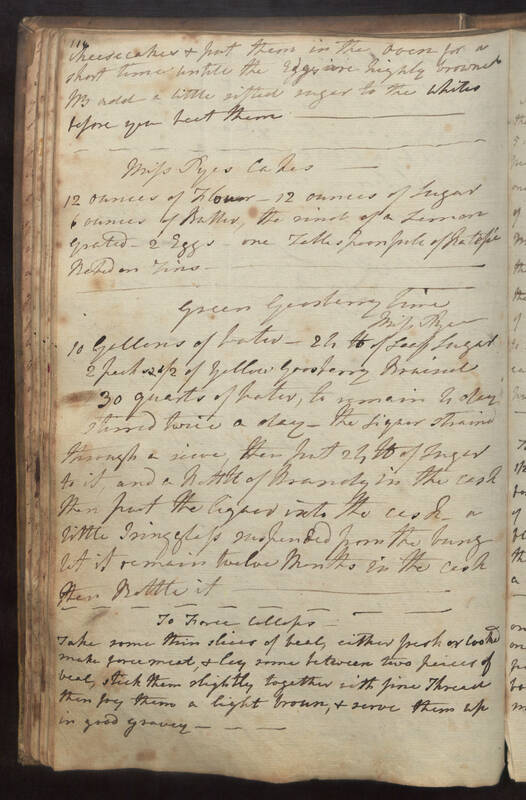 10 gallons of water - 24 lb of loaf sugar 2 pecks 2 1/2 of yellow goosberry Bruised 30 quarts of water, to remain 4 day stirred twice a day - the liquor straind through a sieve, then put 24 lb of sugar to it, and a bottle of Brandy in the cask then put the liquor into the cask - a little Isingglass suspended from the bung let it remain twelve months in the cask then Bottle it. To Force callops Take some thin slices of veal, either fresh or cooked make forcemeat, & lay some between two peices of veal, stick them slightly together with fine thread then fry them a light brown, & serve them up in good gravey.